Mountains shape the Holy Land that lies along the eastern shore of the Mediterranean Sea. Two parallel ranges run from north to south and in between is the country’s most extraordinary physical feature, the deep trench that holds the River Jordan, the Sea of Galilee and the Dead Sea, all part of what is still commonly called The Great Rift Valley. This wide variety of landscapes, from snow-topped mountains to fertile plains to deserts, means that the natural vegetation of the land is very different from one area to another; each supporting a range of different plants and animals. 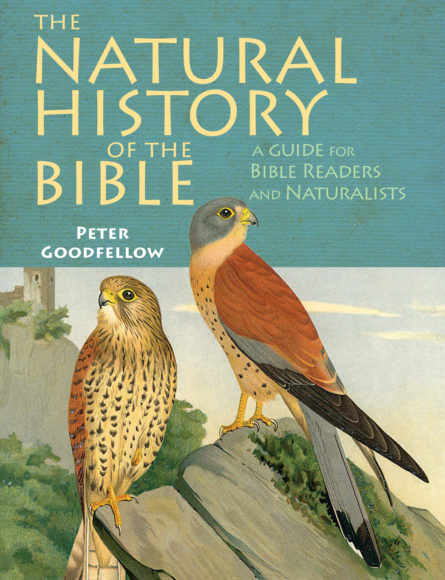 With chapters on physical geography and natural vegetation, trees and shrubs, herbs and flowers, mammal, birds, and other creatures, in this new book, Peter Goodfellow explores the natural history of the Bible tying in his descriptions to biblical references and, where relevant, explaining how these factors influenced the lives of the people of the Old and New Testaments. Peter Goodfellow is a Methodist Local Preacher, has been a keen birdwatcher since he was a boy, and was a teacher till he retired – he’s put all three parts of himself together in this book. He is the author of the highly successful Birds of the Bible and Flora and Fauna of the Bible. He is also the author of a number of several successful birdwatching guides and Avian Architecture which won the 2011 Prose Award from the Association of America Publishers.